The more Adam Sandler movies I watch the more I think I don’t actually like Adam Sandler movies. I guess the real test will be re-watching Happy Gilmore, a movie I’ve always considered myself a fan of, but right now Sandler is striking out. Anger Management and Big Daddy were disappointments, and unfortunately Billy Madison joins them. But is this the sort of movie where one should expect a realistic plot? No, but the basic plot isn’t really the problem. The real problem is that Billy is such an obnoxious immature jerk that it’s completely unbelievable that the love interest (his new third grade teacher) would fall in love with him. The entire “jerk-turns-out-to-be-decent” angle is terribly thin. It makes the same sort of weak character development found in Big Daddy look excellent by comparison. She goes from openly despising him to being head-over-heels for very little reason. Unless the reason is that she is an underpaid elementary school teacher, and he is super rich. That would actually make a lot of sense. I never really liked this Adam Sandler film that much. The only reason I own it is because I wanted Happy Gilmore and for some reason, it was cheaper to buy a two pack with Billy Madison rather than Happy Gilmore on its own. I laughed a lot more than I remember the first time I watched this film. 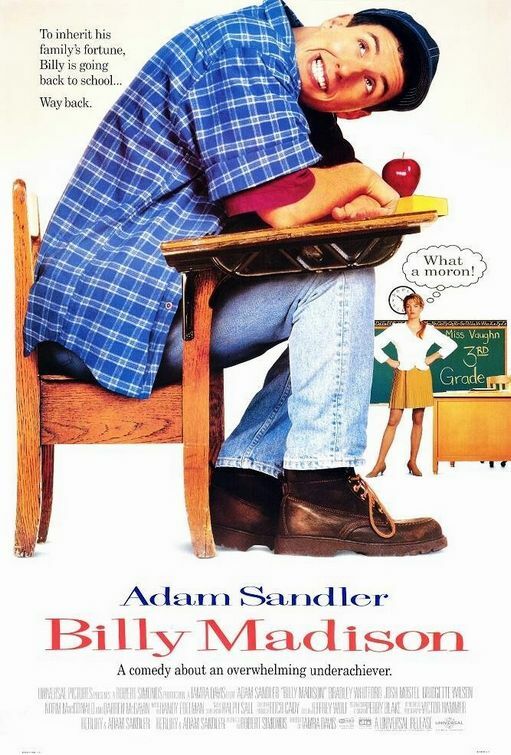 Adam Sandler plays Billy, a perpetually immature bratty rich kid. His dad owns a large chain of hotels and Billy lives of his dad’s fortune in his mansion with his goofy friends (Norm MacDonald). His dad wants to retire, and if he had his way Billy would inherit the company. His company’s board feels Billy is not ready and completely immature. They want to let Billy’s nemesis, Bradley Whitford take over the company as he’s already second in command. When Billy hears this, he sets out to prove his father wrong. He decides to complete school again, years 1-12. Each two weeks he has to pass to the next year. For some reason, the school agrees to this and lets Billy attempt the challenge to prove he is smart enough to take on his dad’s company. I’m not sure how finishing high school makes him qualified to run a multi million dollar hotel company, but that’s not really the point. The point is to get Sandler to interact with a bunch of school kids. Up until he gets to junior high, the film is quite funny. Sandler’s antics with the younger kids in year one to year three are the highlight of the film. By the time he gets to high school, the film gets a bit slow. The first half of the film is quite amusing. Sandler is a lot of fun the way he hangs out with the young kids in first grade. In third grade, we get to meet the film’s love interest. Billy falls for his third grade teacher, the future Mrs Pete Sampras, Bridgette Wilson. She is really pretty, but her character is very standard. There’s not much to write about her. This film is not as good as other Sandler films like Happy Gilmore or The Wedding Singer, but it’s still funny. I really enjoy when a drunk Billy Madison keeps hallucinating a giant penguin. The penguin scenes are probably the highlight for me.